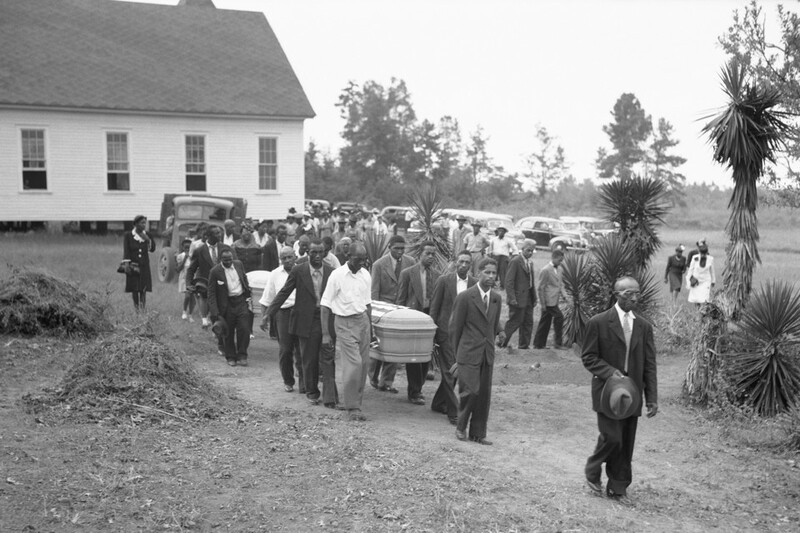 One of the most outrageous and well publicized lynching in the history of the United States took place nearly seven decades ago on July 25, 1946 when two African American couples were brutally killed by a white mob in Monroe, Georgia. George W. and Mae Murray Dorsey along with Roger and Dorothy Malcolm, all of whom were in their 20s, were employed as sharecroppers on the land of a white man named J. Loy Harrison. On July 11, Roger Malcolm was said to have stabbed in self-defense a white man employed on the Harrison farm by the name of Barnette Hester. Malcolm spent nearly two weeks in jail but was released after Harrison paid his bail. Harrison drove Dorothy Malcolm and the Dorseys to pick up Malcolm when they were allegedly hijacked by a lynch mob which killed both couples. This cold blooded and calculated massacre was carried out in the aftermath of World War II during a wave of such killings throughout the South. George W. Dorsey had served in the military during the war in the Pacific and had only been out of the army for nine months when he was victimized by the lynch mob. Some 2.5 million African American men registered for the draft between 1941-45, along with over 6,000 Black women who volunteered in segregated units of the army corps and the navy. After experiencing racism within the military while deployed in the U.S., Europe, Africa and the Pacific, many veterans were not willing to accept legalized segregation and racial exploitation. A more militant political mood was evident in the South and other regions of the U.S. beginning during the war and extending into the late 1940s and early 1950s. This discontent with the status-quo prompted violent retributions by white racists who dominated law-enforcement, agricultural production, business and public service. The Dorseys and Malcolms worked on a plantation where they were subjected to slave-like conditions in the immediate aftermath of an imperialist war which ostensibly was designed to end racial oppression and legal impunity. Although Dorsey served in the military during the war he could only find work as a field hand after returning to the South. The exploitative and repressive conditions in the Post World War II period has been captured as well by the African American press during the period which was filled with accounts of police beatings, killings, mob violence and the rise of the Dixiecrat party, a splinter from the Democratic Party bitterly opposed to even minimal reforms related to granting civil rights to the former enslaved oppressed nation. In the specific situation of the Malcolms and Dorseys, they rode with Harrison from the local jail in Walton County where Monroe is located ostensibly returning to the farm where they worked. Harrison claims that he was stopped by a group of 15-20 men who ordered the African American men out of the vehicle initially and later took the women into mob custody. They were tied to trees, beaten severely and shot to death while Harrison stood in silence he claimed. Mae Murray Dorsey was seven months pregnant at the time of the lynching. Despite a nationwide outcry demanding justice, no one was ever indicted for murder or civil rights violations against the couples. A large number of Federal Bureau of Investigation (FBI) agents were sent into Monroe to investigate the lynching by taking statements from potential witnesses and collecting material evidence. U.S. District Judge T. Hoyt Davis impaneled and directed a 23-man grand jury, which included two African Americans. The grand jury began to hear testimony in the case on December 2, 1946. 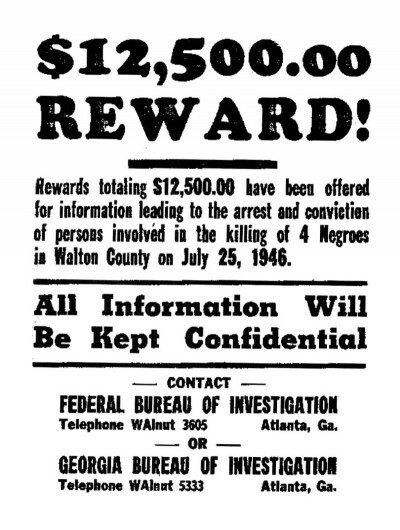 The then Georgia Governor Ellis Arnall stated “that 15 to 20 of the mob members are known by name.” The evidence collected from the investigation was delivered to the grand jury by U.S. District Attorney John P. Cowart and John Kelly who were employed by the Criminal Division of the Department of Justice. Judge Davis “pointed out that federal courts have no jurisdiction over the offense of murder except under well-defined conditions.” After all was said and done some five months later, the federal court, the White House and the FBI said there was insufficient evidence to file charges against the 20-30 white men involved in the massacre. One man who testified before the grand jury was charged with perjury for providing false information about where he was at the time of the lynching. Later in the 1990s, interests in the 1946 mass lynching resurfaced demanding a reopening of an investigation into the massacre. Nonetheless, these efforts did not result in any criminal charges being filed against those who may have participated and were still alive. Every year a re-enactment of the lynching is staged to keep this horrendous crime in the minds of subsequent generations of African Americans and others. This pattern continues through today where African Americans are gunned down routinely by the police and vigilantes and in the overwhelming number of cases no one is held accountable. The local law-enforcement agencies, the courts and the federal government have in most cases proved incapable of prosecuting those who engage in racist violence against the oppressed. The Justice Department has admitted that it does not accurately document police killings and their racial implications. Corporate media outlets documented in 2015 the police killing of at least 975 people. A significant and disproportional number of these victims were African Americans. Mass demonstrations and urban rebellions against the unjustified use of lethal force by the police have accelerated since the killings of Travon Martin in Florida during 2012 and Michael Brown in Missouri on August 9, 2014. Nonetheless, organized and racialized state violence against the nationally oppressed will not be ended until there is a structural transformation of the system of capitalism. Violence and repression against the oppressed and working people in general is designed to maintain the capitalist and imperialist system.